Until recently, this calculator was on display at the Museum of Science and Industry. It is owned by The University of Manchester and is on loan to Tabley House Collection specially for Knutsford Heritage Open Days. 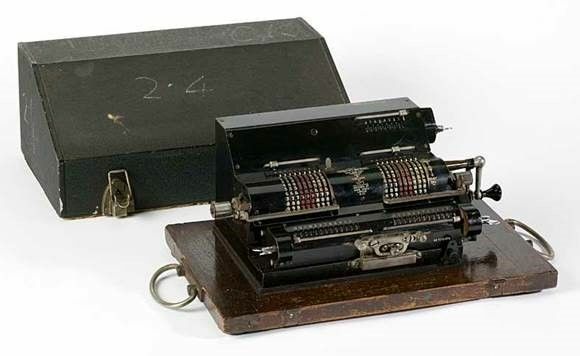 For the very first time, this display will feature both the calculator and Turing’s written order form for it, as evidence of its provenance. The calculator itself is a Britannic Duo, a dual pinwheel calculator made in England by Guy’s Calculating Machines Ltd of London. Machines such as this had specialised technical and scientific uses. The Britannic was first produced during WW1. The dual version features a setting-lever clearing device to zeroing the levers with a single movement and interlocking mechanisms. The house is accessible for those with mobility problems or wheelchair users. Please phone 01565 750151 beforehand if this facility as a separate entrance is used. For those using the usual entrance, please note there are some uneven surfaces and steps. The Tabley House Collection is housed in the finest Palladian mansion in Cheshire. The estate was home to the Leicester family for 700 years, until the mid-1970s. Their legacy includes some of the finest art, furniture and books that money could buy, as well as a fascinating family history. Event contact over the festival: Gill Dent.